Under Real Estate business it is involved in construction of residential apartment buildings, residential row houses, bungalows and commercial projects. It has also purchased lands in Maharastra, Gujarat and West Bengal for construction projects. Recently it started operating and maintaining IT/ITES building in Pune. It has been actively involved with the exports of oils, Groundnut Kernels (HPS), Basmati & Non-Basmati Rice, Sesame Seeds, Black Pepper and other Agro-based commodities. It is situated in Mumbai. The Company also actively participates in Financial activities and capital market operations. 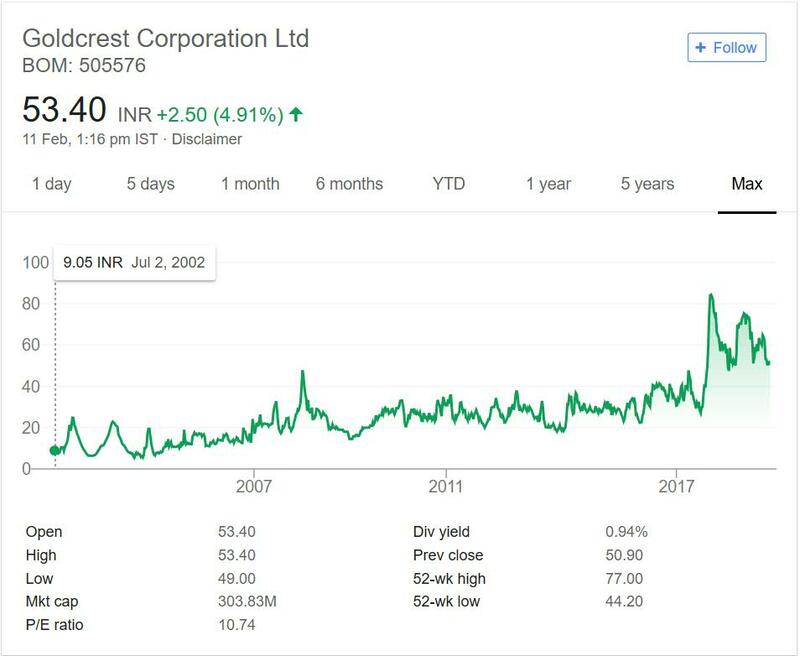 In year 2002 the Company was trading near 9 INR mark. It is now trading close to 54 mark. So in past 16 years it has given 6 times return. At current market price the dividend yield is close to 1%. So people are getting 6% dividend at 2002 price. One thing I liked about the stock is that the price never dipped down in past 16 years. Price was moving downwards only after rise in price before. This means Company performed at flat rate then results improved causing the jump and again it started flat results in line with previous jump. Goldcrest Corporation is a Conglomerate as mentioned above. It is still a small company with three divisions. All of them are capital intensive and does not have uniqueness. Real Estate service model is too old and there are many players in that area competing with it. The commodity business and capital business are also no unique business areas. Personally I prefer small companies focusing on single business. This helps them grow in that area. It is fine if big companies have diversified operations. Big companies have luxury of man power and funds. But for small companies I do not like diversified field of operations. Due to above reason I will not recommend this stock.In case you are interested then you can track the company by adding it to your stock watch list. That way you can keep close eye on the Company.